Annunciation Park is named after the nearby Church of the Annunciation. The annunciation, according to Christian doctrine, was when the angel Gabriel announced to the Virgin Mary that she was pregnant with the Christ child. The church, founded in 1853, originally stood on 131st Street to the east of the Boulevard (the old name for the northern section of Broadway) in a church building constructed in 1854. At the time, the neighborhood was a rural hamlet called Manhattanville. Noted for its elevated views of the Hudson River and its distance from the unhealthy environment of New York City, the community was connected to New Jersey by ferry beginning in 1808, and to New York City by streetcar beginning in 1853. The church was adjacent to Manhattan College, one of two religious institutions of higher learning (the other being the Convent of the Sacred Heart). Manhattan College was founded in 1853 by the Christian Brothers. In 1921, Manhattan College moved to the Riverdale section of the Bronx, where it remains to this day. The Convent of the Sacred Heart stood between 126th and 135th Street and Amsterdam and St. Nicholas Avenues. In 1952, it sold its property to City College of New York for use as a South Campus and moved to Westchester. Meanwhile, the Church of the Annunciation moved to 131st St and Convent Avenue in 1906, where it remains to this day in a large, neo-Gothic building. Next to Annunciation Park is a small, castellated building of dark stone that resembles a romantic folly. In fact, its original purpose was highly functional. It was built in 1890 as the gatehouse for the joining of the New Croton and Old Croton aqueduct systems. The city built the Old Croton Aqueduct from 1837-1842 in response to the lack of a consistent supply of clean water. The lack manifested itself in the Great Fire of 1835, which destroyed a quarter of the business district, as well as in several disastrous cholera epidemics. The Old Croton system was one of the 19th century’s great engineering feats. A gravity feed system, it conveyed water from the Croton River in upper Westchester County at a slope of 13 inches per mile, meaning that the conduit had to be bridged across valleys and tunneled through hillsides. Engineered by John Bloomfield Jervis, it was marked by landmarks such as the Roman-inspired High Bridge and the observation tower, both the work of Jervis, and terminated at the Croton Reservoir at the current site of the New York Public Library and Bryant Park. This satisfied the city’s water needs for a time being, but New York’s rapid growth soon outstripped the system’s capacity. As a result, the city’s engineers began plotting the New Croton aqueduct in the 1880s, largely as an underground stone tunnel. Water mains from the two systems met at 135th Street, and engineer Frederick Cook designed a miniature castle to house the fairly utilitarian functions hidden inside. 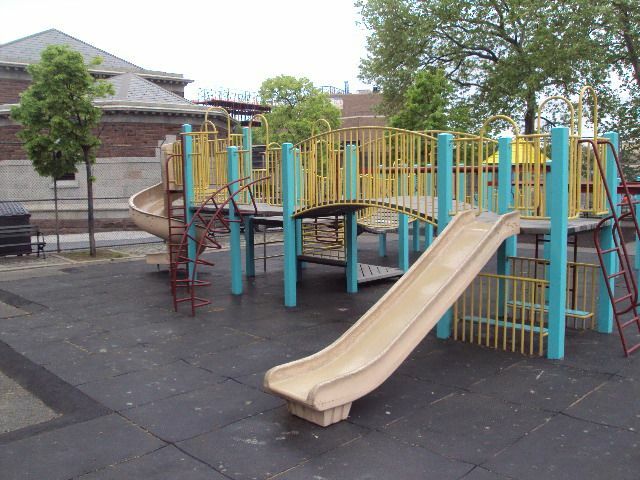 Annunciation Park sits between 134th and 135th Street and Amsterdam and Convent Avenues. 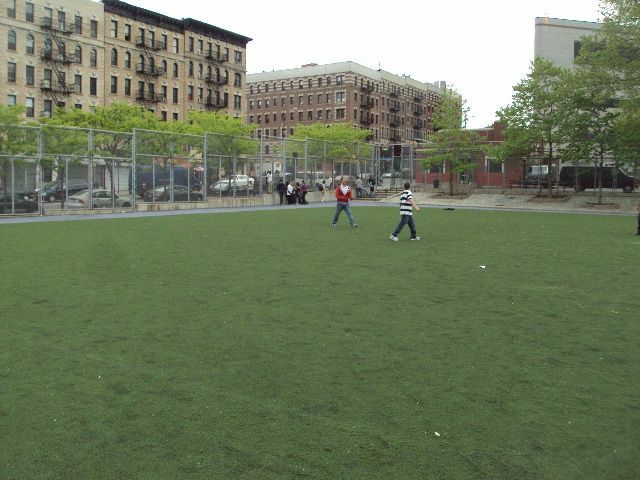 It contains basketball courts, play equipment with safety surfacing, a red brick comfort station, and an open asphalt activity area with game lines. In 1996, Mayor Giuliani provided new chain link fences and guide rails for the park.